Overview: Anyone who has ridden dirt bikes or BMX will appreciate our Moto gloves. Like so many other garage builders and bikeriders, we love the thin palms and snug fit of modern mechanic's gloves, but can do without their NASCAR-approved colors and graphics. 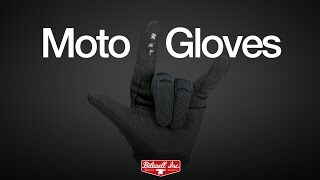 For pure understatement, Biltwell Moto gloves certainly deliver. It doesnﾒt get much more stealth than black on black. The fingers on Moto gloves run long and stretchy, so we recommend going down one size to ensure a snug, comfortable fit. If you like your gloves tight, order one size smaller, they stretch. They fit snug so you don’t get any rolling of the material. In the description, everyone said to order one size smaller than you would normally wear. I ordered the medium, and they are too small. I ended up giving them away. Great Gloves & a price you can't beat! These are very comfortable and pretty thin, so theyre perfect for riding in the heat in Charleston, SC. You can't complain about the price either, and the shipping was really fast as usual. Thanks LowBrow Customs! The only complaint about these gloves I could have are, they started fraying on the finger tips pretty quick. But theyre holding up well so I can't complain too much.